The rate of maternal deaths has dropped by almost 44 per cent over the past 25 years, according to a new report by UN agencies and the World Bank. The data shows that maternal deaths - the deaths of mothers either in pregnancy, giving birth, or in the six weeks after birth - have declined from about 532,000 in 1990 to a predicted 303,000 this year. 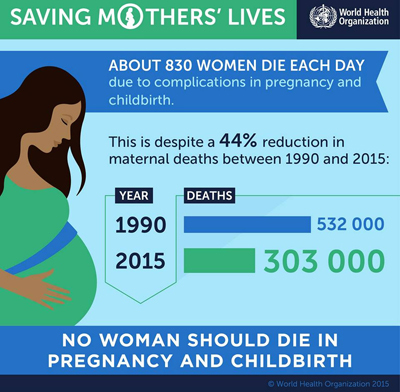 This equates to a drop in the global maternal mortality rate from 385 per 100,000 live births in 1990 to 216 today. While experts have hailed the progress made, they note that this still means about 830 women are still dying each day due to complications in pregnancy or childbirth. Dr Flavia Bustreo, the assistant director general for family, women's and children's health at the World Health Organization - one of the organisations involved in the report's creation, said while the decline represents "real progress", "it is not enough". "We know we can virtually end these deaths by 2030 and this is what we are committed to work towards." The recently announced Sustainable Development Goals (SDGs) include a target of reducing the rate of maternal deaths to less than 70 per 100,000 live births by 2030 - which to be achieved would means substantially increasing the rate of reduction. The report - which child focused agency UNICEF, the United Nations Population Fund (UNFPA) and United Nations Population Division were also involved in the creation of - shows that 99 per cent of maternal deaths occur in developing regions with the sub-Saharan region in Africa alone accounting for 66 per cent - or 201,000 deaths - a year despite the nearly 45 per cent decrease in the maternal mortality rate over the past 25 years. Southern Asia has the next highest number of maternal deaths with 66,000 a year. Regionally, the highest rates of maternal deaths are currently being seen in sub-Saharan Africa - 546 per 100,000 live births - and Oceania - 187 per 100,000 live births. At a country level, Nigeria and India are expected to account for more than a third of all maternal deaths this year with 58,000 and 45,000 expected maternal deaths while Sierra Leone has the highest maternal mortality rate of 1,360 per 100,000 live births. Meanwhile, the greatest decline in the number of maternal deaths since 1990 has been seen in Eastern Asia which has seen a 72 per cent drop in the maternal mortality rate, from 95 deaths per 100,000 live births to 27. But only nine countries - Bhutan, Cabo Verde, Cambodia, Iran, Laos, Maldives, Mongolia, Rwanda and Timor-Leste - achieved the Millennium Development Goals target of reducing the maternal mortality ratio by at least 75 per cent between 1990 and 2015. Dr Babatunde Osotimehin, executive director of UNFPA, said better access to heathcare was essential to reduce the number of maternal deaths.